Japan's Ministry of Communications and Transportation established 13 Pilot Training Schools before the end of World War II with the first two opening in 1938. These served as training facilities for pilots who would work in the Ministry of Communications and Transportation primarily to carry mail by plane. During the Pacific War, the Army and Navy increasingly used these Pilot Training Schools as sources for much needed trained pilots. During the Pacific War, the Army had ten of these schools, and the Navy ran the other three. 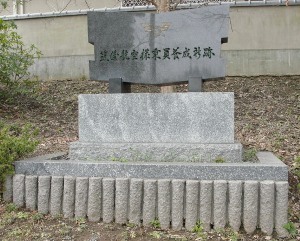 The Army ran Chikugo Pilot Training School, which was established in 1944. From the 13 Ministry of Communications and Transportation Pilot Training Schools, there were a total 3,200 men who graduated, received supplemental flight training at Army and Navy training bases, and became noncommissioned officers. As Japan's situation worsened toward the end of the war, 162 graduates from Pilot Training Schools died in special (suicide) attacks. In April 1944, a Pilot Training School was established to train civilian pilots here at this location in Chikugo and Yame . This airfield was constructed with land provided by local residents and volunteer labor of district residents. We young men who yearned for the skies gathered together here in those days from all over the country. We remember our joy as we worked hard day and night in studying and training and lived together with our wings. Now we erect here this monument with fond regard for the blue skies as we remember the past and hope for eternal peace and prosperity. 1. Chikugo and Yame are two small cities in Fukuoka Prefecture. 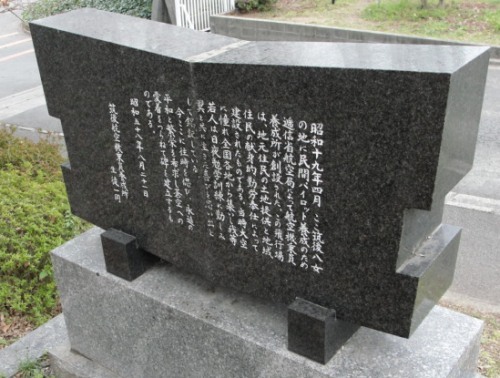 The monument is located in Yame near the border with Chikugo.